The kind of days that I dream about are here. I love warm, dry days and cool to cold nights. August always seems to be that kind of month here, so it's a treat after all the nasty humidity we have coped with during July. The crickets are revving up their little songmakers and the grasshoppers are getting big. Yesterday I started on and continued many projects. Got a batch of soap going, made some more dryer balls in readiness for a housewarming gift, finished spinning 4 oz of the Corriedale fiber that I want to ply with the silk/camel blend, and tried to knit a few rows on my High Plains Drifter shawl/scarf. So many things happening at once had me a little crazed about the soap as I kept coming back to check the temperatures of both the oil and the lye/milk. I thought I had the temps about the same as usual, maybe just a tad lower than I usually do, but it didn't reach the trace point as it usually does. And when I was pouring it into the molds it continued to be very liquid-y. I was beginning to think it was a giant fail! I refused to hover, however, and I didn't check it until I was on my way to bed. This morning it looks as though the soap is as hard as it should be, so I am very relieved! And the morning is a spectacular one, as you can see by the goats who didn't want to get up when I went out to do chores. One of my favorite kinds of mornings, when I have the chance to be home and enjoy it. Air is coming in from Muscongus Bay, bringing with it the smell of the ocean and some mist. It really is almost August! Had a visit from our grandboy for the weekend which was lovely. 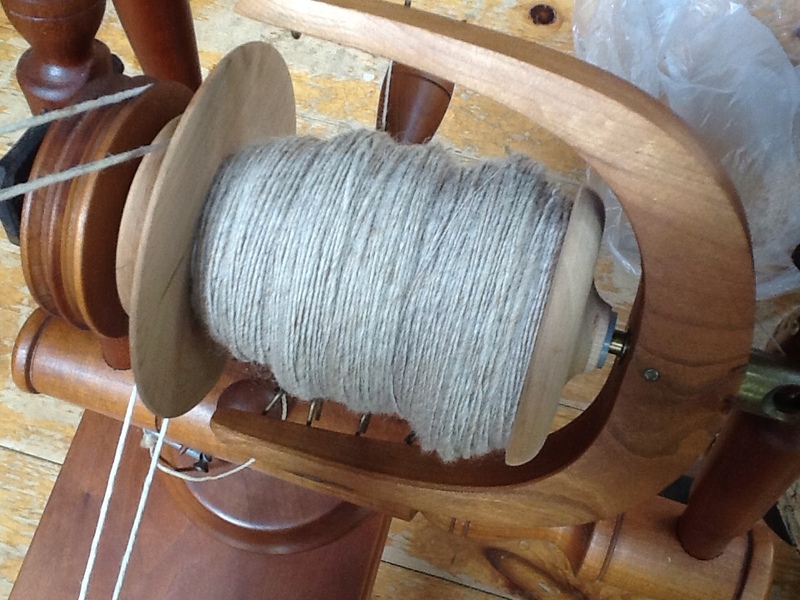 Got a little bit of the Corriedale fiber spun on my big Jensen production wheel, much to his delight. He was smitten with the lovely machine and also very respectful of it, thank goodness. I don’t know what he thinks of fiber, but he was definitely delighted with the wheel. 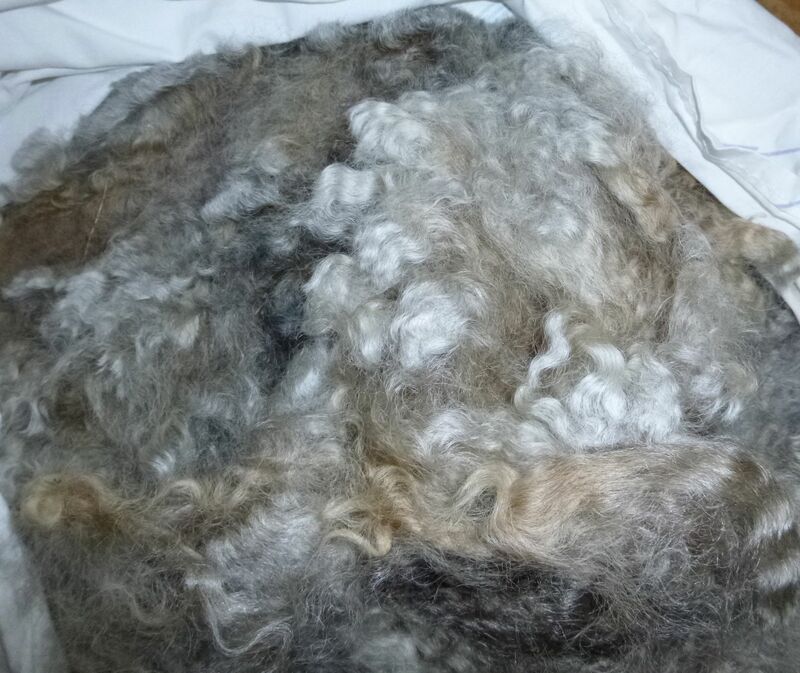 Today I really need to get onto skirting the two fleeces that Emily sheared for us last week. It’s beautiful fiber. 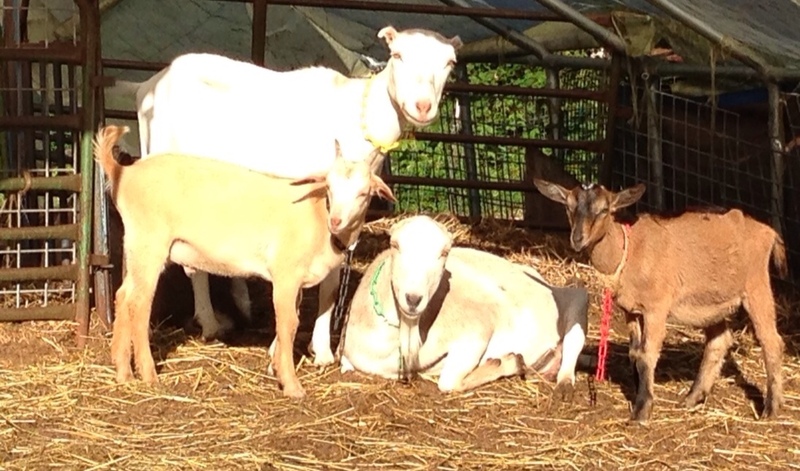 Beezus is the ewe who had the prepubic tendon rupture just before her first and only lambing in 2012. We had not considered having her stick around so last September when Emily came to shear the market lambs I had her shear Beezus, thinking she would have to go to the butcher and become sausage. 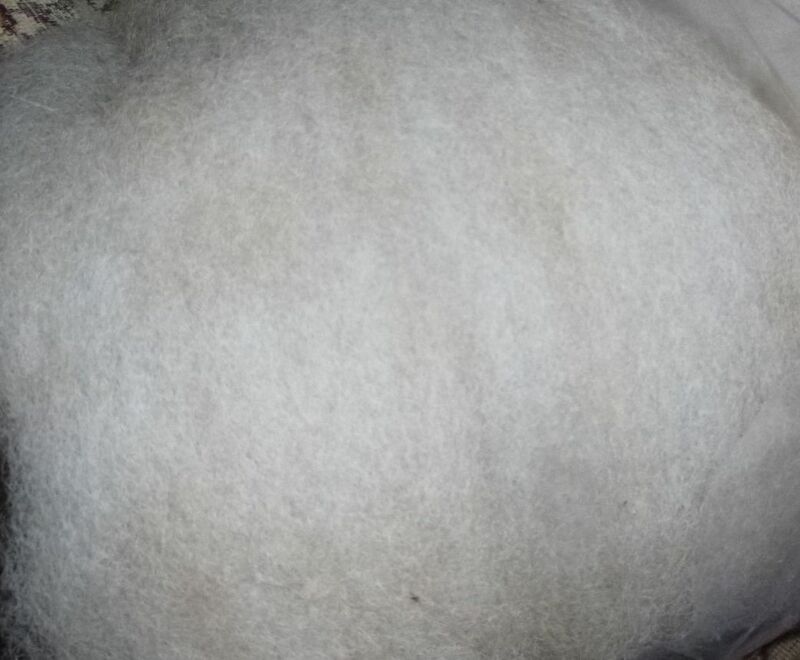 After we got her summer fleece off we realized that her rupture had remained the size it was when it happened. So we decided to keep her around for her gorgeous blue fleece, and hope that she remains healthy. Well, two days of IT training in Brunswick and one day in Rockland have left me pretty beat. Today was a rainy one so it didn’t feel bad being inside. Lots of good and exciting stuff there, and it definitely has me more excited about the new school year than usual! But, back to our fibery pursuits on the retreat last week! We all had our separate projects, both knitting and spinning. 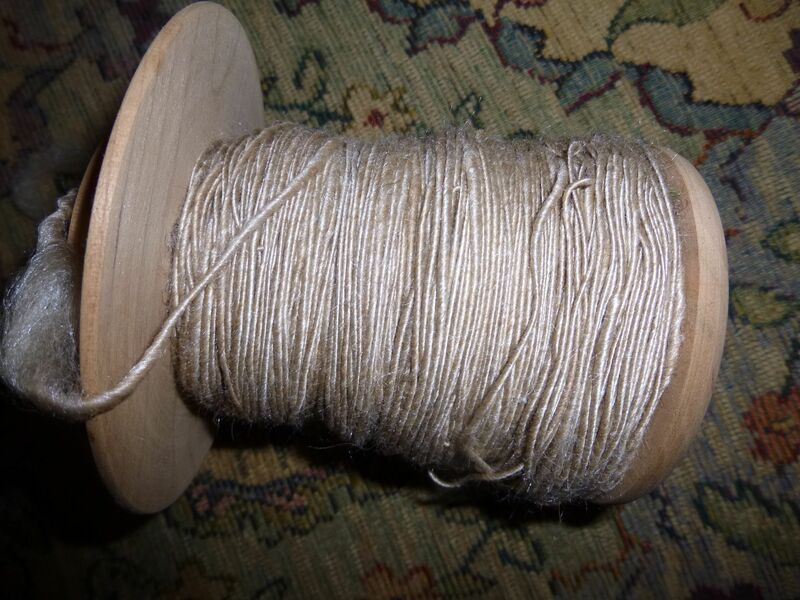 I accomplished an amazing amount of spinning, 4 oz of a silk/camel blend that I got from The Fold quite awhile ago now. I have been planning on plying that with the fleece that I have been carding up from long ago (a Corriedale hogget fleece). I am in love with the colors, all of them natural. The fleece is a pinky/beige and the silk/camel is a white and beigey mix. The photos probably don’t convey the real colors (I am not a great photographer, either). These are not typical fibers for me, they are much more a ‘luxury’ type of spinning than I usually do (and much thinner than I usually spin). I am very hopeful that I will be able to get more finished on this project before school begins again. I also am continuing to knit on my shawl project, the High Plains Drifter pattern, out of our farm’s sock weight yarn (our sheep’s wool mixed with a little bit of a friend’s mohair). 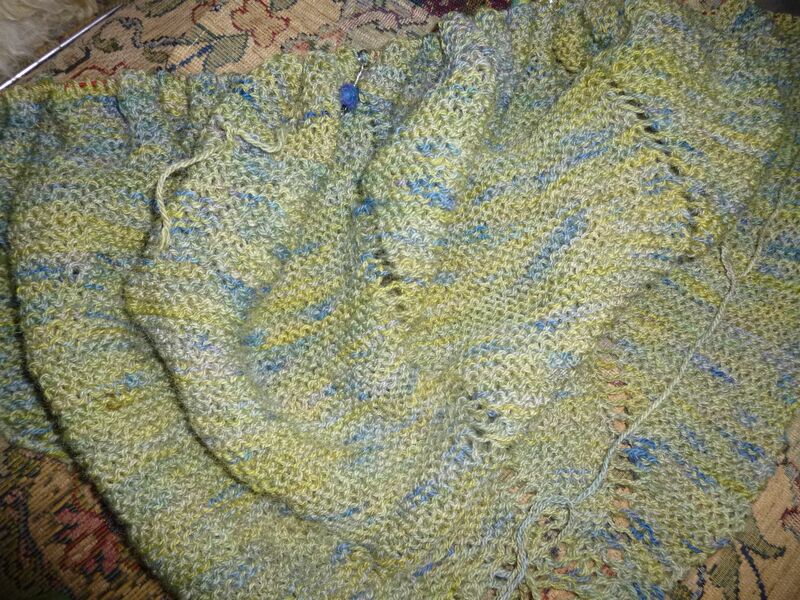 I actually got quite a bit finished on our retreat, at least half of a 220 yard skein, and at least a quarter of the second 220 yard skein. I am loving it, and it’s such an easy knit, not too much to keep track of, that I can take it with me places I would not take something a little more complicated. This meant that when I got up at 5 a.m. and went outside with my first cup of coffee to admire the view and the sun coming up, I didn’t have to strain my brain to get some knitting done! 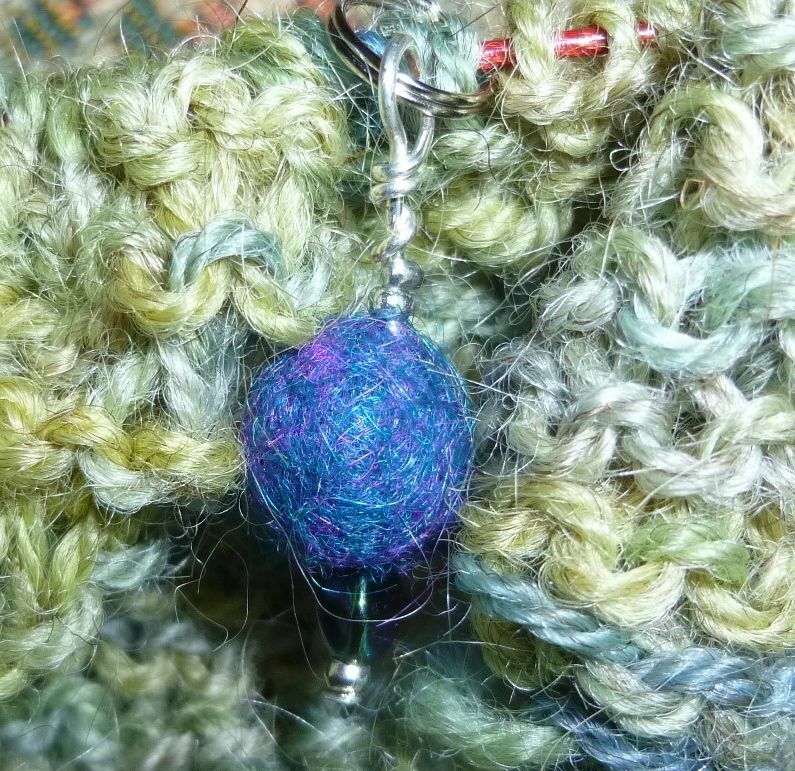 All of our fiber friends had wonderful projects going, and one of our fiber group, Kelley, also brought all of her beading materials and taught us to make felted stitch markers. They were a lot of fun! And I already am using most of the markers that I made. They are lightweight and really easy to use. Plus, they are rather beautiful. One other fiber pursuit that I do not have any photographic evidence of is that our friend Chris taught us all how to do the Magic Loop method of knitting in the round. I have thought that it was a giant mystery, but now I can visualize the process. The next mitt or sock that I make will be using the Magic Loop. Great stuff! And so our fiber retreat really was a huge success. I know that I didn’t want to get off the ferry and get back into everyday life, but it certainly is a wonderful bunch of memories that I will certainly enjoy for quite some time. And there is always next summer’s retreat to begin planning! I just spent two hours on a blog post and then lost it. 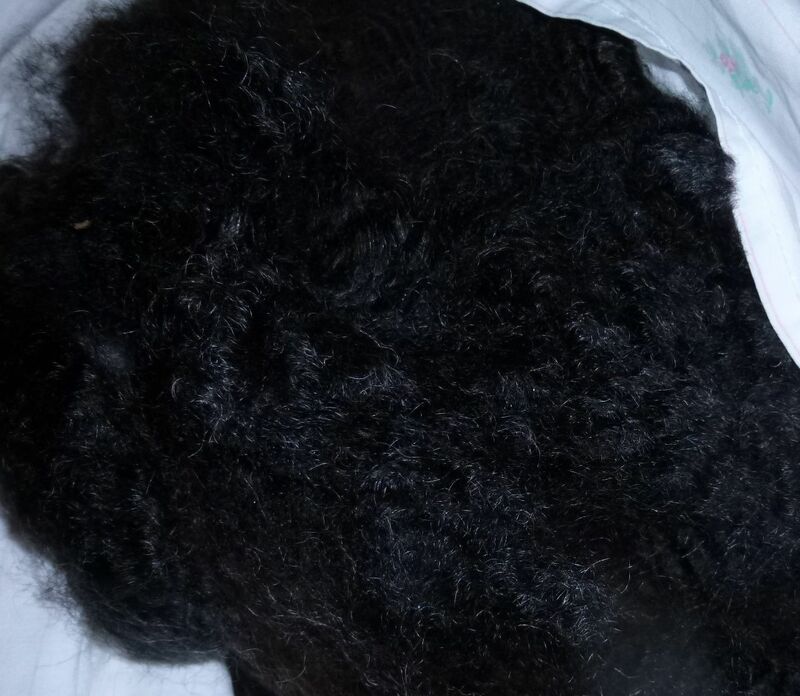 All I can say is that I had a great post about the fiber we all brought to our weekend retreat. I will have to re-do the post, most likely tomorrow. 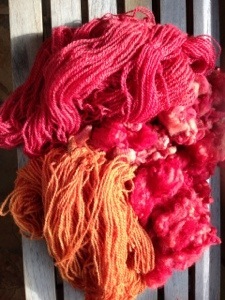 Here is a visual treat for you: some of the fiber that we did a dye experiment on over our weekend! Arrived back on the mainland last night after spending an absolutely awesome 3.5 days on Vinalhaven with 4 other Salt Bay Treadlers. Wow is about all I can say! We definitely had a fantastic and fiber-filled weekend. The added bonus was that the mainland continued with extreme heat and humidity until early on Sunday morning, while the island wind and water kept us deliciously cool. 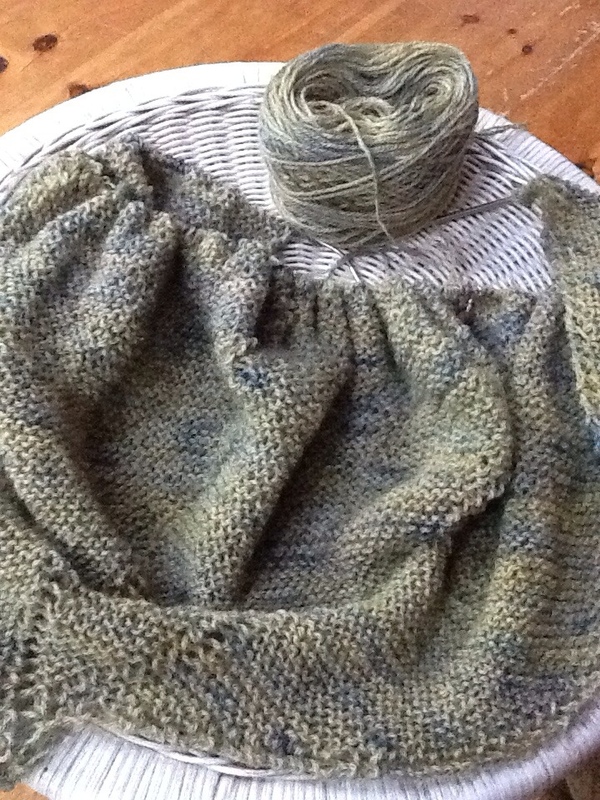 Not free from the humidity, but it was so much more comfortable that we were able to get a lot of fiber spun and knit. The friendship and fun made it an extremely rejuvenating experience. I will share more of our fun in the next few days. Right now I will highlight our traveling photos. The ferry trip from Rockland, Maine to the island of Vinalhaven is about 1.25 hours. Delightful in setting up the anticipation on the way over, and restful on the way home, giving us a nice transition from the weekend. I love being out on the water and this was a real treat! 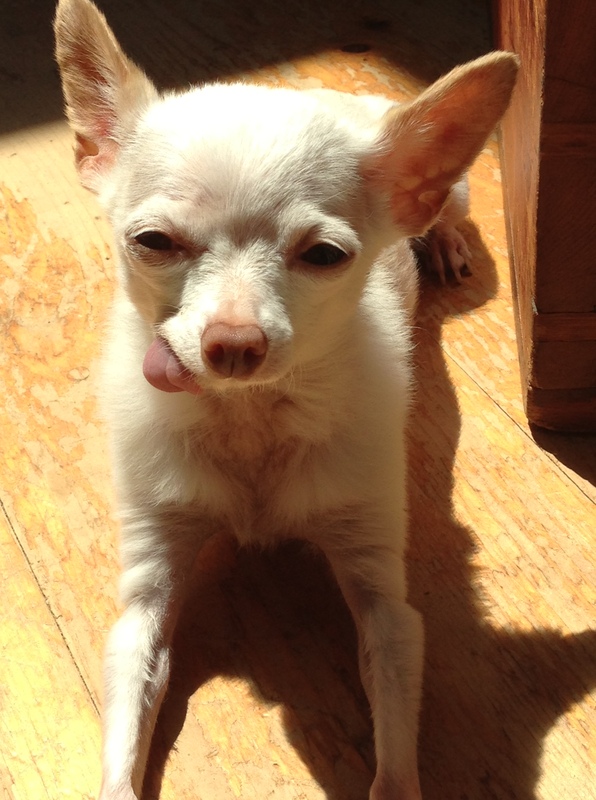 Tesser the Chihuahua may be the only one enjoying the heat and humidity! I am definitely looking forward to this coming weekend. Our little spinning group, the Salt Bay Treadlers, has organized a 3.5 day retreat. The Maine Spinner’s Registry does one in the summer and typically it takes place at a ski resort. Two years ago Chris, Christine and I joined the larger group at Sugarloaf. It was a fun weekend, although an extremely hot one. This year 5 of our local group decided that we wanted to do some kind of get-away, but being a July weekend, did we want to go to the mountains, or possibly find a way to go to the ocean? Connections were made, and we ultimately found a house to rent on the island of Vinalhaven. It sounds like heaven right this minute, and I can’t wait to get out there on Thursday. The heat and humidity continue, making life and farming just that little bit more challenging. I really shouldn’t complain, most of the country is experiencing the same weather conditions, so it’s not anything anyone else isn’t coping with. And at least close to the coast we are finding occasional onshore breezes every once in awhile. Farm Market Saturday. Thank goodness the humidity has been very low for the past four days or so. We have had some awesomely beautiful weather. Lots of people came out for the market this morning, and we had a lovely time. Pam of Hatchtown Farm and I share a booth as we sell pretty much the same product, and we have much more fun that way. And if one of us can’t be there, usually the other one can cover the booth. The big fun today was that we had a visit with my husband’s cousins from New Jersey. They were on their way to a camping vacation in Bar Harbor, so they stopped by for a few hours on the way. It’s been a long time since we have seen them, and it was a lot of fun. We spent some time in the fiber loft, and quite a bit of time with the animals as well. It was just perfect. 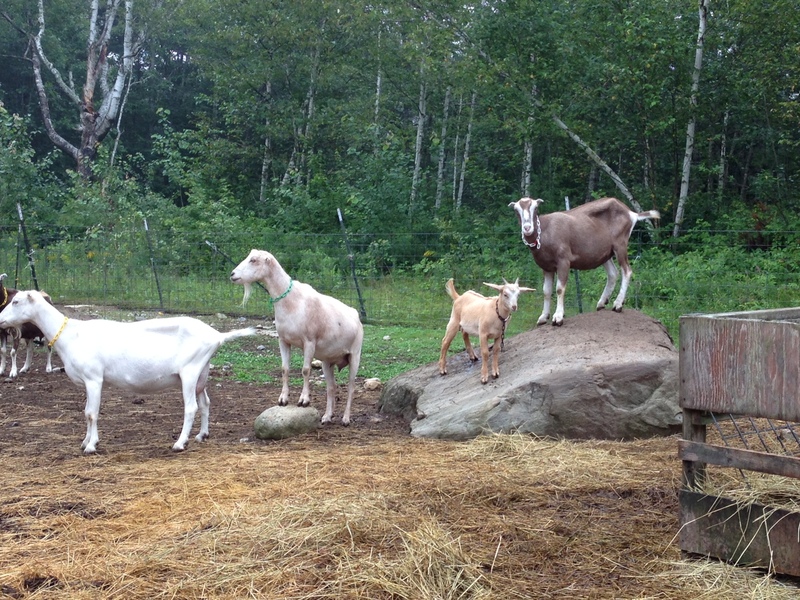 The goats were over their midday naps and milled around trying to figure out who the new folks were. Very nice day. It’s been crazy weather here. We went from hot and humid to rain, and then to cool and damp. I admit to liking the cooler weather, and today ended up being cloudy, and as the afternoon wore on, the mist began rolling in from Round Pond. I love a good foggy day on occasion! As my back heals and gets a little less painful I am trying to catch up on a few things around here, and I am also trying to get some sewing projects started. I don’t think that I have had my 1951 Singer machine going in 10 years. It’s been some fun. And sew it goes! Maybe I will be able to do a photo shoot of my little projects in a few days. I won’t promise, but at least I am flexing some unused muscles for now. Photos above are random shots from today. Well, the new boy didn’t cry all night, which is a blessing. His breeder told us that he was a bit of a mama’s boy, so I was mildly worried about it, but these things usually work themselves out. I stayed out with the group a lot yesterday, trying to monitor how he was interacting with them all, and he took his lumps, but seemed to be learning his way around. This morning I went out and found that he was bedded down in the greenhouse with all the other goaties and the llama. So even if he’s not best friends with anyone yet, he felt comfortable enough to be there, and obviously they let him. And today he seemed to be warming up to the other little buck and this afternoon found them frolicking on the big rock, and nibbling at each other’s collars, jumping around separately-but-together. Which pleased me for sure. 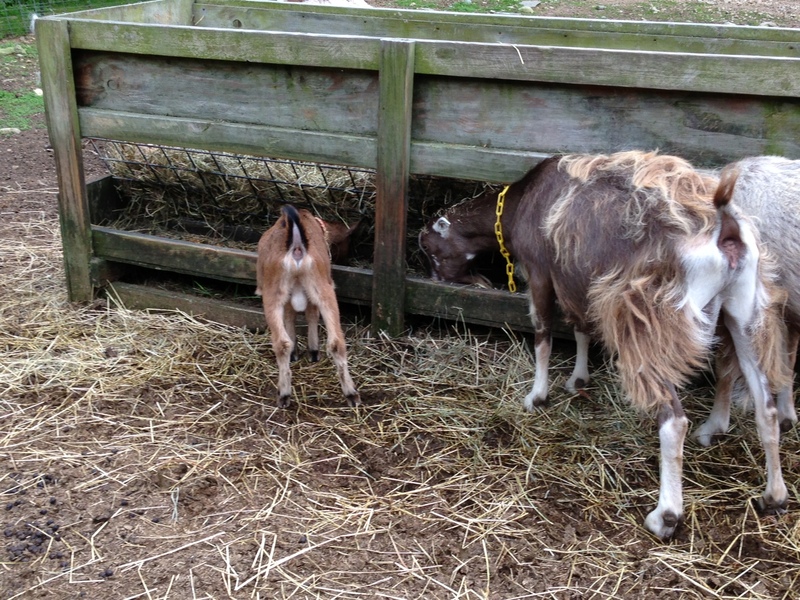 Our new little guy also has some tricky moves up his hoof: this is what I found him doing at feeding time this afternoon. 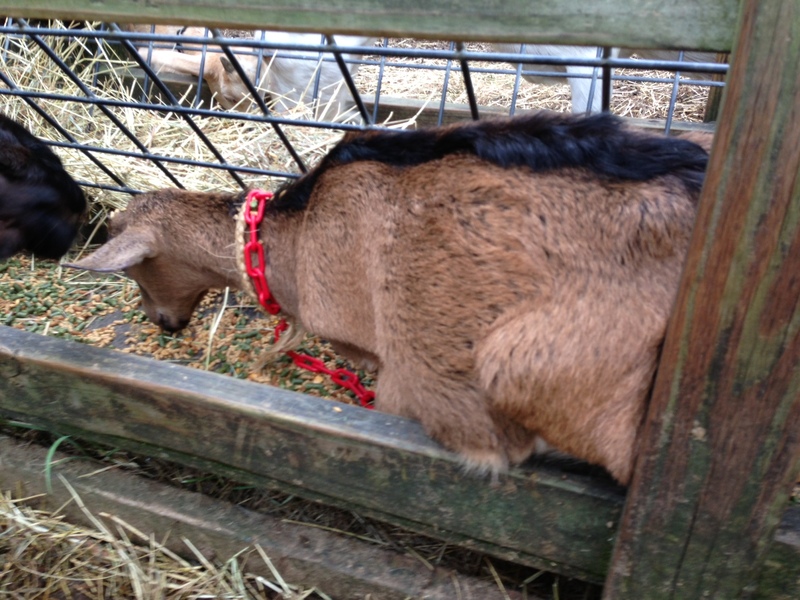 Yes, you got it, he is IN the feed trough, eating his way across. Little bugger figured out a way to get his grain and the adult does couldn’t push him aside! Oh boy, it was pretty funny. And I guess he is a good role model, because the next thing I knew, our little golden boy was doing the same thing on the other side of the feeder. Tricky boys! The girls didn’t know what to do about it, so they left them alone. I just need to prevent these little guys from gobbling up too much grain, or they are going to have sore bellies. 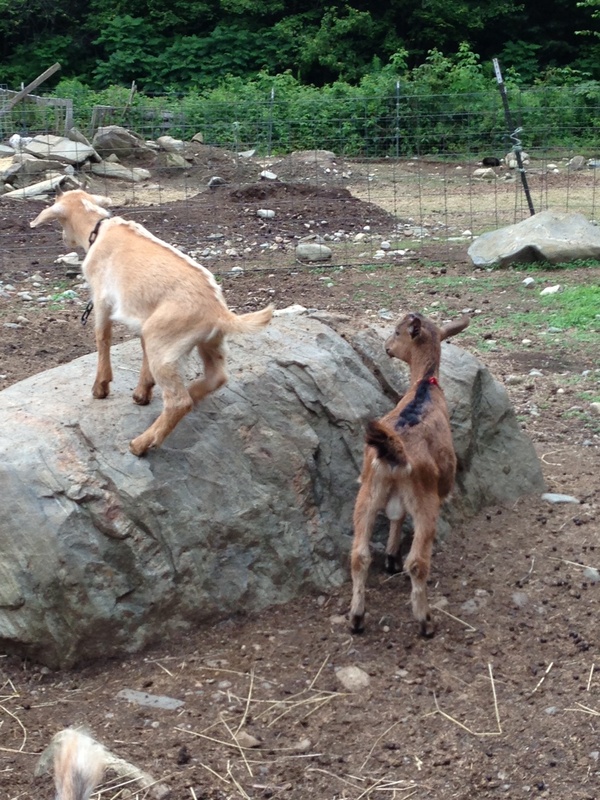 They didn’t stay in the feeder long, pretty soon they were out and playing on the rock again. While the mamas cleaned up the grain. 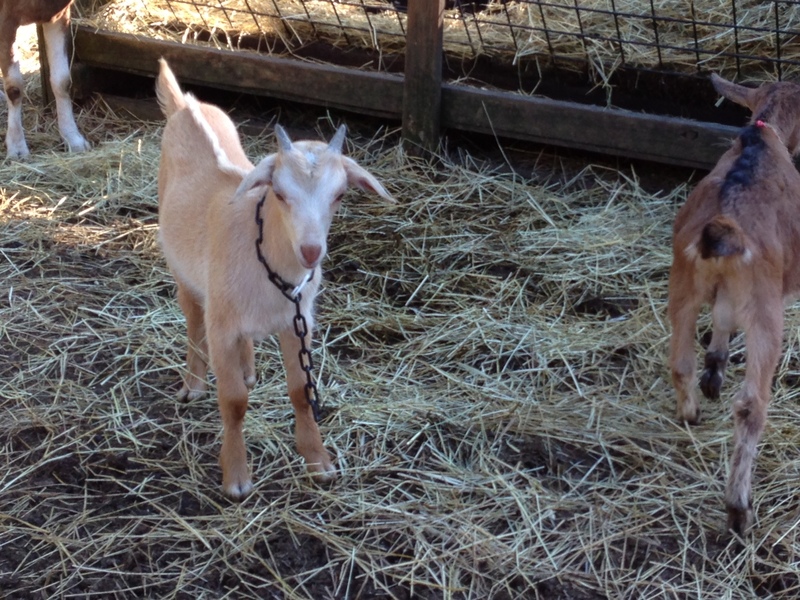 A beautiful Alpine/Lamancha buckling has come to our farm. He is a lovely boy and I hope that he finds his place in the herd. 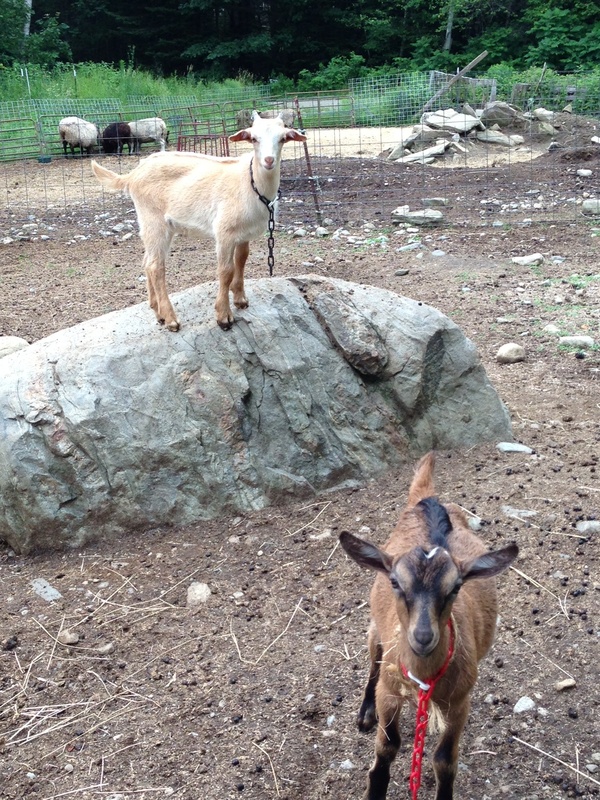 Sheep and goats have a serious pecking order, and anyone that’s been separated from the herd or flock for awhile, or any new animal coming in, has to take their lumps and find a place within the group dynamic. Being the new kid, and a kid at that, doesn’t give him much clout. I am hoping that he becomes friends with SnowPea’s bucky boy. They will have some fun together, I am sure. Right now the does are being a little unkind to him, and the sooner he gets used to hanging out with the llama, the better (if he would just look around and notice that the lambs all take turns hanging out with big Zorro, he would realize that no one else would bother him!). 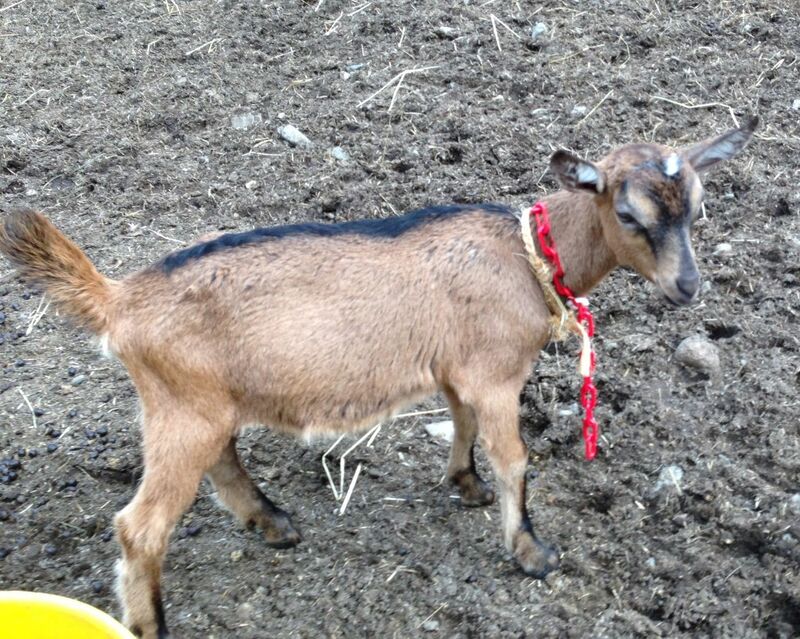 His previous family had named the two bucklings they had this year Butch (our guy) and Sundance (his brother). Not sure he looks like a Butch to me, so we will have to get to know him a little better and see what name fits him. This is the buck that we are hoping will do our breeding for us this coming fall. Fingers crossed! 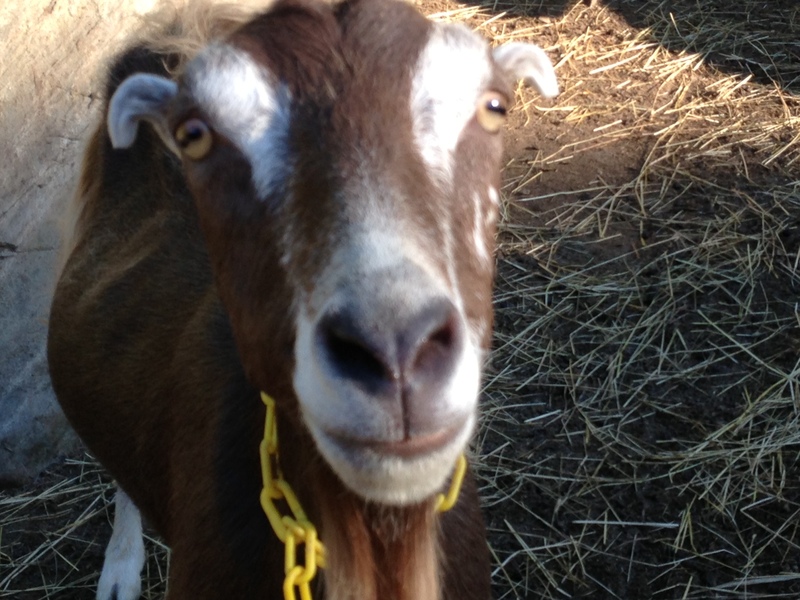 We need some luck where goat breeding is concerned. He is a beautiful little guy.